Apple SVP of Internet and Software Services Eddy Cue joined media partners during Monday's Code Media conference, covering a wide range of topics including the company's upcoming Apple Music exclusives "Planet of the Apps" and "Carpool Karaoke." 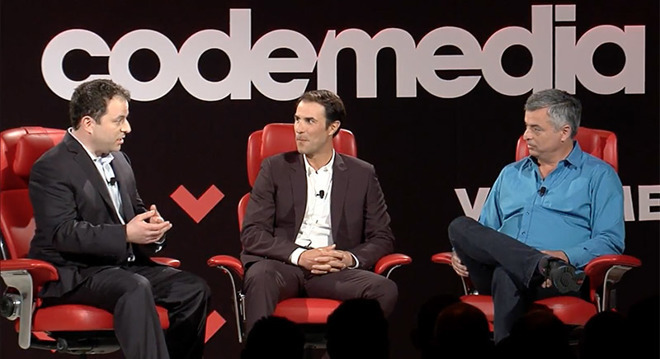 Recode's Peter Kafka (left) interviews Apple SVP Eddy Cue (right) and Propagate CEO Ben Silverman. After a Cue offered the usual platitudes about Apple Music and its ability to cultivate pop culture, he turned the stage over to CEO of Propagate Ben Silverman, who is working on "Planet of the Apps." As Silverman explained in lengthy detail, "Planet of the Apps" was conceived with his partners, including musician Will.i.am, long before Apple got a look at it. After shopping the concept around to the usual players in the television space — who supposedly all wanted to sign on — Will.i.am successfully pitched the show to Apple during a meeting regarding an unrelated subject. The series itself is reminiscent of popular reality shows like "Shark Tank," in which independent developers from around the world pitch their ideas, in this case apps, to a panel of high-profile "mentors." Jessica Alba, Will.i.am, Gwyneth Paltrow and Gary Vaynerchuck make up Apple's cast. Apple Music DJ Zane Lowe also appears to play a role as show emcee, talking to contestants before they go in front of the panel. Unique to "Planet of the Apps," contestants have to sell the judges on their idea in a 60-second "escalator pitch" that has them literally explaining their app as they ride down an escalator. Once at the bottom, panelists swipe left or right on an iPad to show their interest, or disinterest, in the developer. As seen in a clip provided during tonight's conference, panelists vie over the best ideas and developers lucky enough to have interest from multiple judges can choose who to work with as they further cultivate their concept into a working app. Outside advisors from Yelp, Uber and other major brands will subsequently help the teams during an incubation period . The end goal is a chance to pitch in front of Lightspeed Venture Partners. According to Siverman, Lightspeed put up more than $10 million to fund the winning app. When it launches this spring, "Planet of the Apps" will be accompanied by a standalone iOS streaming app, allowing viewers to watch current and past episodes whenever they choose. New installments will debut each week, like a traditional TV series, though viewers will be able to reference past episodes through the app. As such, the show will air without ads. Among the benefits of airing a reality show like "Planet of the Apps" on Apple Music's digital platform is immediacy. For example, viewers will be able to download and use the winner's app as soon as they show is finished, a feature not possible on television. Apple already said it plans to give the winning app a prominent place on the App Store once the final show airs. As for Carpool Karaoke, Recode was able to suss out an official launch date from Cue, who said the hotly anticipated adaptation is expected to hit Apple Music in April. During the keynote interview, Apple's Carpool Karaoke partner and Late Late Show with James Corden producer Ben Winston offered additional details about the forthcoming series. A take on shorter Carpool Karaoke segments popularized by Corden's talkshow, Apple's version pairs musicians, actors, sports stars and other personalities together as they go on a road trip. A second trailer for the show debuted at Code Conference and was subsequently posted to Apple's YouTube channel. The accompanying explainer says 16 celebrities will ride along together and sing tunes from their personal playlists. In the video, the pairs, including Corden and Will Smith, are found driving along public roads and making pit stops at a grocery store, bar, Krispy Kreme and more. The short spot also reveals a new Apple Music section called "TV & Movies," which at this point is limited to "Planet of the Apps" and "Carpool Karaoke." Not yet included in Apple's latest iOS beta version, the unreleased feature appears to function in a similar fashion as current music videos. Episodes are laid out in a list on iPhone, or grid-style on iPad, while tapping on a particular installment brings up a video viewing card. A tvOS version for fourth-generation Apple TV units is also rolling out.